On the outskirts of Addis Ababa sits the engineering and production facility of one of the world’s most cutting edge high technology firms, the Ethiopian-American firm dVentus Technologies. This firm and its success could be a harbinger of change across the entire African continent. It was here, one early morning this month, that America’s top foreign trade envoy, Michael Froman, huddled with two officials of the U.S. Agency for International Development, Assistant Administrator (Africa) Earl Gast, and Power Africa Coordinator Andrew Herscowitz, to hear a briefing by dVentus CEO Daniel Gizaw. Gizaw, an Ethiopian-American, is fascinating realization of the American Dream. A graduate of the University of Gdansk in Poland, Daniel was able to transfer to the University of Wisconsin and work on his PhD there. With more than 20 years’ experience in the USA designing state-of-the art electric motors, generators and electronics drives and extensive expertise in management of technology, Daniel founded Danotek Motion Technologies in Ann Arbor, Michigan, about ten years ago to serve the specialized needs of the advanced transportation and renewable energy industries; by 2005, he formed an engineering team in Ethiopia to support the U.S. operation. He also acquired expansive prior experience in the areas of research, product development, staff engineering, and operation management for General Electric, GM-Electric Vehicle, Cummins Power Generation, and Ford Motor Company. Gizaw’s success led into several patents and major commercial breakthrough including GE’s ECM motor, the Cummins variable speed generator, and Ford’s flexible fuel vehicles’ electronic brushless fuel pump and, most recently, Danotek’s high efficiency Generators for Wind Turbines and Cogenerations. Backed by venture capital and strategic investors, Danotek eventually became a world class manufacturer of large megawatt wind turbine generators. Gizaw was nominated entrepreneur of the year by the State of Michigan and Ernst & Young and served on Michigan Governor Granholm’s Committee for Renewable Energy. It was then that Daniel Gizaw decided that it was time to return to the land of his forefathers and build out a major portion of his global business “dVentus” there to serve high growth and underserved market. Diaspora trade and investment linkages are often the strongest strands connecting developing countries to the wider global economy, but it is important to continually nurture them. 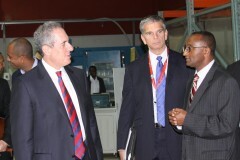 Interestingly, dVentus Technologies was not a major exporter or beneficiary under the African Growth and Opportunity Act (AGOA), the primary reason Ambassador Froman and other senior U.S. officials were in Ethiopia attending the annual AGOA Forum. But dVentus is a private sector partner in Power Africa, the initiative announced by President Obama during his recent trip to Africa. Power Africa seeks to address one of the critical constraints to sustained economic growth and human development on the continent: more than two-thirds of Africans do not have access to reliable electricity. Companies like dVentus are a key part of the Power Africa strategy: harnessing the private sector, its expertise and resources, to jump-start African power sectors in multiple countries that have suffered decades of under-investment and mismanagement. In some cases, Power Africa will increase electricity generation by reducing the risks and therefore the costs associated with key power projects. In other cases, Power Africa works directly with African governments to improve their capacity to manage and expand their power infrastructure. In still other cases, Power Africa will work at the local level, providing grants to small developers to build out small scale clean energy solutions for rural communities that are too remote to connect with their national grids. The dVentus story, and the U.S. Government’s role in it, is a unique one. Daniel Gizaw’s venture has contracted with the Ethiopian utility to develop and manufacture two million smart meters that will significantly improve the efficiency of energy use across the national grid. dVentus also has plans to develop its other two lines of business in Ethiopia and the broader region: wind turbines and propulsion systems for clean energy vehicles. In each case, the innovation and the manufacturing will take place in Ethiopia and the United States, strengthening the commercial ties between both. dVentus already invested from its internal resources over $2.5 Million USD. Different streams of government and private sector support have come together to support the dVentus expanding operation. AfDB is looking into providing $1M assistance for renewable energy and energy efficiency project. USAID will be providing a credit guarantee through its Development Credit Authority Diaspora Facility for a $1 million working capital loan to support the smart meter development. OPIC is exploring longer-term financing for the manufacturing phase. At the same time, RENEW, a private firm that channels angel investment into emerging markets, has arranged investment into dVentus from several American Angel groups. The dVentus story exemplifies the public-private partnership approach of the Power Africa Initiative and how small, innovative firms are changing the landscape of the power sector in Sub-Saharan Africa. Really it is interesting to see this kind of professionals and companies in Ethiopia. Really appreciate Dani for his initiative in bringing new idea to Africa. Ethiopia’s green energy source potential will take your journey to success very soon. Hope Mekele town of Ethiopia will have three electric chargeable dVentus vehicles/ following your advertisement in African Adaptation programme. Ethiopia requires in earnest all diaspora knowledge. What Daniel made available will take Ethiopia one step ahead of others. PPP and large scale development shall be the next step. Please allow me to ask you a question. I have a great ambition for further education. American Universities, Harvard or Columbia or Yale. Event employment in your Organization. i would like wish you peace and health. Thank you Dan for you great effort to make it happen. At last,Home is sweet home.